Don't let the thought of pricey eco-friendly products thwart your desire to lead an eco-friendly lifestyle. Learn how you can do it while on a budget. One of the biggest obstacles to switching to an eco-friendly lifestyle is how expensive and inconvenient it can be. Buying only organic foods, shopping at Whole Foods, and opting for biodegradable packaging can really put a dent in your expenses. However, there are hundreds of changes you can make today that will not only help you reduce your carbon footprint but can even help you save money. Yes, you heard me; you can actually save money and save the planet at the same time! Living a more eco-friendly lifestyle isn't just about preserving the environment. It impacts your health as well. Toxins are present all around us. These toxins enter our bloodstream through skin contact and inhalation and contribute to cancers, tumors, and ailments. By reducing your exposure to these chemicals, you can drastically improve your well-being and the well-being of your family. 1. Say "no straw, please"
Before a waiter at a restaurant or an employee at a fast food store has a chance to bring you your drinks, say "no straw, please". Why? Because restaurant and fast food employees are typically trained to bring you a straw regardless of whether you want one or not. Some will even bring your drink with the straw already in there, so you can't even hand the straw back to them. Otherwise they'll just throw it away and you just wasted a perfectly good straw. I've learned this the hard way. Plastic straws are one of the largest polluters of our landfills and oceans and pose as much of a problem as plastic bags and plastic bottles. In the United States alone, over 500 million plastic straws are used every single day. At that rate, think about how many plastic straws accumulate in our landfills and oceans annually. In my opinion, plastic straws are pointless. Some people use plastic straws to avoid placing their lips on what could be a contaminated cup surface, but how do you know the inside of the cup isn't just as contaminated? If that's the case, you should just avoid eating out altogether. Others use plastic straws for convenience. If you're one of those people, then I would recommend buying glass straws and carrying a few of them in your purse or car to use when the moment strikes (I certainly wouldn't argue against using a glass straw when you're drinking a slushie). Glass straws are endlessly reusable and even if they end up in a landfill or ocean, they don't release toxic chemicals like plastic straws do. In my opinion, they also make your drink taste better. For some reason, everything always tastes better in glass, wouldn't you agree? You can buy glass straws online on Amazon, or buy them from an eco-friendly online store like Life without plastic. With all the plastic bag wars and media coverage out there, you don't need an expert to tell you how bad plastic bags are for the environment. Over one million plastic bags are consumed per minute. Fish ingest this plastic - because plastic has chemicals that make it taste like food to fish - which travels up the food chain and onto our dinner plates. When I first started on my eco-friendly journey, one of the biggest challenges I faced was remembering to bring a reusable shopping bag with me. I would then end up having to carry most of the items I purchased in my purse or would be forced to carry all my items in a pile with my hands. There were also times when, I hate to admit, I didn't have any other alternative but to use the plastic bags offered by the grocery store and watch on pitifully as they sometimes double bagged some of my items. Why do you need 2 bags for a gallon of milk?! To overcome this obstacle and make your life easier, carry a reusable bag everywhere you go in the trunk of your car. That way if you start your grocery shopping and realize you've forgotten your reusable bag, getting one is a walking distance to the parking lot. An even better idea is to carry multiple reusable bags so that if you forget one at home after unloading your groceries, you have a backup bag in the car during your next trip. You can also buy reusable grocery bags on Amazon or on Life Without Plastic. Think carefully about decisions you make, particularly about your purchasing decisions, and about how they might affect your health or the environment. For example, when you purchase a new set of dishes and you have the choice between glass or plastic, choose glass. This is not only a friendlier option for the environment - when they eventually outlive their use and are sent to a recycling center or, worse yet, to a landfill - but they are also safer for the health of you and your family. Plastics are known to release BPA (Bisphenol A) into your food, especially when heated, and even those that are advertised as "BPA free" are usually made of BPA alternatives, like BHPF (fluorene-9-bisphenol), that are as toxic or even more dangerous than BPA itself (read more about BPA and BPA alternatives). Glass can also be reused over and over, and even recycled again and again, without any loss in quality. The same can be said for stainless steel. Most importantly, neither glass nor stainless steel leach any harmful toxins into your drinks or food when exposed to heat. I know many will say that recycling plastic is another way to live a more eco-friendlly lifestyle, but I'm going to tell you that this conventional wisdom is flawed at best. Yes, recycling is better than disposing of plastic in the trash, but there are hundreds of reasons why recycling is not the environment saving solution many tout it to be. Plastic recycling is actually downcycling; it can only be recycled a limited number of times before it must be sent to a landfill. Some cities only recycle certain types of plastic, which many city residents are unaware of. The plastic that can't be recycled or that the city chooses not to recycle is sent in batches to a landfill where they will take hundreds of years to decompose. They'll even dispose of plastic if they deem it isn't profitable enough in terms of resale value. New plastic is always required to recycle used plastic. Therefore, recycling plastic still increases the demand for new plastic and petroleum based fossil fuels. Recycling is an energy intensive process that requires more energy than the energy required to process virgin plastic. If you have some extra time, I would highly recommend this video by the Plastic Pollution Coalition that briefly explains why plastic recycling is not a viable long term option. In future articles, we'll discuss why biodegradable plastics are also not as eco-friendly as you may think. Carrying a reusable water bottle with you or in your car will go a long way to helping you avoid disposable one-time use plastic water bottles, which are harmful to your health and to the environment. 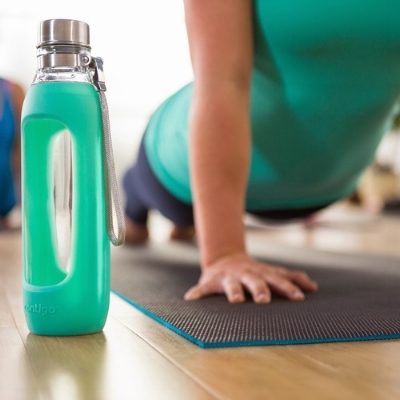 When choosing a reusable water bottle, I would once again recommend either glass or stainless steel to avoid the toxic BPA and BPA alternatives used in many plastic reusable water bottles. I myself use a reusable glass water bottle, and even though some people may say there's no difference in taste, I feel like my water always tastes ten times better in glass than it does in other alternatives like stainless steel. Here is the brand that I use and highly recommend -Cognito. You can either buy one online or at your local Target store. The reason more and more companies are offering eco-friendly services is the fact that eco-friendly has become a popular buzz word that more consumers are paying attention to. In other words, consumers are voting with their dollars and companies are taking notice. As consumers, we need to continue this trend and voice our preferences with the purchasing decisions we make. While I understand that there are budget restrictions to some purchasing decisions we make (like shopping at Whole Foods), there are many eco-friendly service companies whose prices are competitive to other service companies who are not eco-friendly. By supporting eco-friendly service companies, we're not only benefiting the environment and protecting our health, but we're also influencing other companies to adopt more eco-friendly business processes when they're looking to improve their bottom line. Buying from eco-friendly service companies also increases the demand for eco-friendly resources, which helps spur development of more eco-friendly technology and products. Do you work for an eco-friendly service company in Arizona or have a preferred go-to eco-friendly service company? Please let me know in the comments down below. ViriClean is currently gathering a database of eco-friendly service companies in Arizona to refer customers to. Do you know what happens after you use toxic chemicals or chemical cleaners and dispose of them down a drain, flush them down the toilet, or dump them in your yard? Hate to break it to you, but they don't just disappear into nothingness. Toxic chemicals and chemical cleaners, such as those used by popular cleaning brands like Clorox, Glade, and Tide, are known to contain cancer causing agents like pthalates, reproductive toxins and endocrine disruptors. Toxic chemicals that are poured down the drain pass through underground pipes and are sent to a waste water treatment facility. The water is then treated before being sent on to larger bodies of water. However, large amounts of chemicals poured down drains can react with one another to create poisonous gases that are emitted into the atmosphere. They can then go on to contaminate the larger bodies of water they are sent into, which can poison and kill marine life or travel up the food chain. In this case, only two of the three eco-friendly glass cleaners listed are more expensive than Windex, and only by a few cents. Would you compromise your health and the safety of your family members for a a few extra cents? I sure wouldn't. The good news is that the majority of health and grocery stores now carry at least a couple eco-friendly brands on their store shelves, so you don't have to go out of your way just to find eco-friendly and sustainable cleaning products. Electricity is generated by power plants, and power plants burn fossil fuels to create electricity. The fumes released by the burning of fossil fuels release byproducts like carbon dioxide, sulfur dioxide, and nitrogen oxides into the atmosphere, which contributes to pollution and the accumulation of greenhouse gases (Source). One simple change you can make today to be more eco-friendly while at the same time saving money is by shutting off the lights when they're not in use. This one is a win-win for you and the environment! Some people have a habit of falling asleep with the lights on. I used to be one of those people! Make it a nighttime ritual to shut off all the lights in your home before you go to bed. In fact, make it a game by keeping track of how much money you save on your electricity bill each month, and see how low that bill it can go. This one goes hand in hand with the last point about shutting off your lights. Power down your computer before you leave work for the day. At home, power down your electronics, such as your laptop, desktop, and even ipad, when they're not being used. Microfiber cloths are the new "it" in cleaning technology. They're versatile, washable and reusable, and they clean 99% better than regular cloths by just adding water. Better yet, they can save you hundreds of dollars in paper towel costs, and can be washed anywhere between 100-500 times. Before I switched to microfiber towels, I estimate I would use about 2 or 3 paper towel rolls at home per week, at a minimum. At $2 per roll, this equates to at least $104 per year, or $8-9 per month. Ok, ok, I know what you're thinking. $9 per month is probably less than your Netflix subscription bill. But what if on top of Netflix, you could also afford a Hulu subscription at $7.99 per month?! I kid again. But seriously, some people spend way more than what I used to spend on paper towels, especially if they have a 5+ member household with pets included. Plus, a few extra dollar savings per month here and there can really add up if you follow at least a few of the suggestions listed in this blog post. I promise you, if you switch to the more eco-friendly microfiber towels, you will absolutely love the fact that you did, and you'll never look back to using regular cloths or paper towels again. They clean so efficiently with such little effort and reduce your water usage, which is another plus for the environment. .
You can buy microfiber towels at your local Costco store for $17.29 for 36 towels, which I'm willing to bet will last you for years. This is another double whammy for being more eco-friendly and putting some money back in your wallet. There are so many great deals out there that can be found by buying other people's gently used stuff. Some of the stuff you can get at a thrift store or by browsing Craigslist is over 50% cheaper than what you can get new at a higher-end store, and they look just as new. Consider the cost of a brand new vehicle. The moment you drive off the lot with a brand new vehicle, the value drops by more than 10%. Why pay thousands of dollars more when you can buy a car that will look just as new and work just as well with only a few thousand miles on it? The same should go for other important purchases in your life, such as furniture and cleaning equipment. The manufacturing of new products and materials consumes tons of energy and requires the burning of fossil fuels, and we know that the burning of fossil fuels emit dangerous greenhouse gases into the atmosphere. Yes, there's no denying that having the newest, latest gadget feels nice, but how long does that feeling usually last? For me, its usually fleeting and dissipates after only a few short days. Wouldn't you rather feel good knowing you're doing your part to preserve our planet instead? This one is easy-peasy and a no-brainer. Nowadays, almost all companies have a paperless billing option. If you haven't already made the switch, simply log onto your online billing account and the option is usually available under your account settings. If you can't find it, you should be able to make a quick call to the company and request a switch to paperless billing. This switch is also a safer option anyway, since you don't run the risk of getting your mail lost or stolen and exposing your sensitive personal and financial information. As a vegetarian, there's no denying that my idea of a perfect world would be to have everyone around me become vegetarian; however, I know that it's unrealistic to assume that will ever happen. Instead, I'd like to encourage you to reduce your consumption of meat. Animals consume a tremendous amount of energy and resources during their lifetime before being put through the chopping mill. 3. Save money. Meat is expensive. There's no denying it. By eating less meat, you naturally reduce your meat purchases and may see a drastic reduction in your spending. Plan 2 or 3 nights a week where you don't cook meat for dinner, or choose a meatless entree at a restaurant, and you'll see the savings add up. 2. Shed a few pounds. Meat is more calorie dense than other foods like veggies, grains, and beans. By eating less meat, you'll naturally eat less calories which will help you shed those extra pounds. Take a look at the following picture comparing how 400 calories of meat in your stomach equates to 400 calories of veggies. How much more calories of meat would you have to consume to be fully satiated? 3. Naturally eat more veggies. One of the initial reasons I became a vegetarian was my desire to force myself to eat more veggies. When you're at a restaurant, it's difficult to force yourself to choose the salad entree over the meat entree. However, if you've restricted yourself from meat altogether, you leave yourself no other option. I'm not saying you should go cold turkey like I did and quit meat altogether to eat more veggies, but creating a weekly plan where you force yourself to minimize your meat consumption will naturally divert you toward more veggie options - as long as you're staying away from unhealthy processed foods of course. There you have it. By implementing these easy changes in your lifestyle today, you're well on your way to protecting your health, the environment, and putting some extra money back in your pocket. Who said living an eco-friendly lifestyle had to be expensive? Ok, I may have hinted at it at the beginning of this article, but sticking to an eco-friendly lifestyle is all about budgeting and making smarter choices, just like anything else in life. This blog post didn't even scratch the surface of the hundreds of ways you can lead a healthy and environmentally friendly lifestyle on a budget. Let me know what other changes you might consider implementing or have already implemented in the comment box below. ViriClean's house cleaning prices in Arizona are competitive, affordable, and easy to understand.